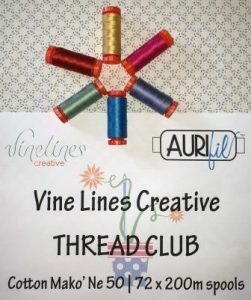 I’m very pleased to present the Aurifil Thread Club. Over the course of twelve months, you’ll receive a total of 72 small spools of specially selected Aurifil thread colours. Six spools will arrive on your doorstep each month. You can pay either per month, in two instalments, six months apart OR in one instalment. If you pay in the six monthly instalments, you’ll receive a free small spool of my favourite piecing thread, 50wt 4060. The amount of each instalment is $259 (plus delivery), totalling $518 (plus delivery) for the year. You will be invoiced for the second instalment six months after the first. Please remember – by purchasing this option you are committing to TWO INSTALMENTS of $259 plus delivery. The total cost is $518 plus delivery.